While I was in Hongkong attending a conference few years back, I planned to visit IFC mall with some of the friends. A big board displayed in the mall read as - Whoever said money cant buy you happiness, did not know where to go shopping. I always believed that Happiness can never be bought with money. Thoroughly convinced about Easterlin Paradox on Money and Happiness. However when I read about Bill Gates and went through the collection of his quotes by Lisa Rogak, I started believing, yes one does buy happiness with money. There is a person who is proving this. And that person is Bill Gates. Having tasted the money, which is sweeter than honey, he has reached to a level where the fifth position of Maslow's need hierarchy in the form of self-actualisation is achieved through the good deeds of charity and looking at the projects contributing to the welfare of society for different causes. He seems to be enjoying and really feeling happy through making others happy. A classic case of teaching the whole world The Art of Giving. Apart from money one requires a big heart to think like that. And that is where Bill Gates shows his concern and commitment. I am sure he would be remembered by many generations later, may be even after 300-400 years to have contributed to the eradication of HIV AIDS, eradication of many such cancerous diseases and to have respected human lives. This book is a collection of statements made by Bill Gates throughout his career. The collection of the statements by Lisa is really remarkable and they are not really put in chronological order, rather she has chosen theme based alphabetical order which makes it easier to the reader to find related statement. 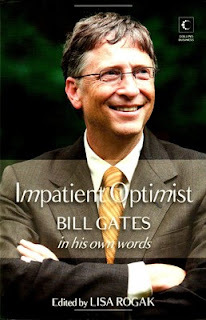 If one has not read the biography of Bill Gates, after going through this book, much of his life become clear and in that effort Lisa really deserves appreciation. After reading the whole book I felt as if I read a story about a great person, about a person who dropped from his college, went on to take risk through his entrepreneurial venture, and after achieving greater heights in life through developing excellent products and creating blue oceans, comes back to his college and collects the degree (honoris causa). The journey of this great person is portrayed through the words borrowed from many of his speeches, few books and write ups. I really liked the milestones section very much where the chronologically his achievements are reported. It really makes a good book for collection and reference for students to whom he really inspires through his deeds. It makes a good as well as a simple read. Really the title is very catching, impatient optimist, who does not want to be one. However if one is looking for some serious stuff on Bill Gates, one can very well ignore this title. I think short of the transporter, most things you see in science fiction are, in the next decade, the kinds of things you'll see. The virtual presence, the virtual worlds that both represent what's going on in the real world and represent whatever people are interested in. This movement in space as a way of interacting with the machine. I think the deep investments that have been made at the research level will pay off with these things in the next ten years.